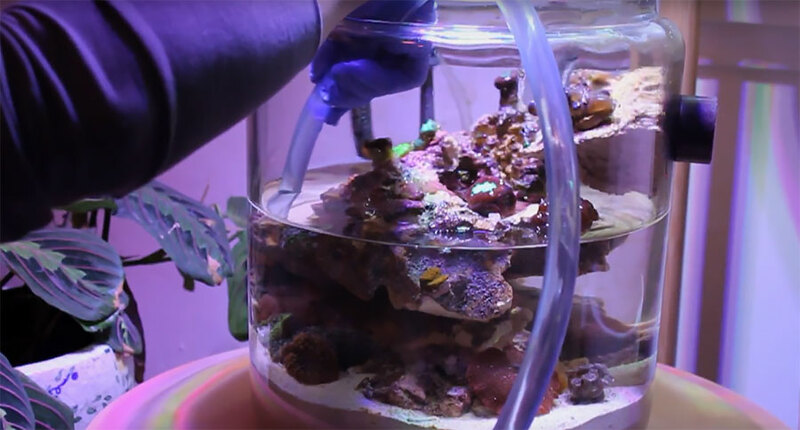 Watch as reef aquarist Gena demonstrates how easy it is to perform a water change on a reef jar, reef bowl, or vase reef. One of the secrets of micro-reefkeeping is regular, 50-100% water changes. Even veteran marine aquarists can find this a new skill to learn. Here’s one approach. Pico Reefkeeping enthusiast Gena has been successfully keeping reef aquaria of larger sizes for years. She was featured by Nano-Reef.com in 2012 for her 12-gallon reef aquarium, and then again in 2015 for her 45-gallon display reef. This time, however, it’s a 2-gallon cookie jar reef aquarium she’s sharing, detailing how she performs a 100% water change on the diminutive system. Watch more of Gena’s Reef Aquarium Videos on her YouTube channel.